BURBANK, CA (May 8, 2014) - Prepare for a battle of the ages when the Justice League takes on its archenemies, the Legion of Doom, as Warner Bros. Home Entertainment, Warner Bros Animation, and DC Entertainment unleash JLA Adventures: Trapped in Time. 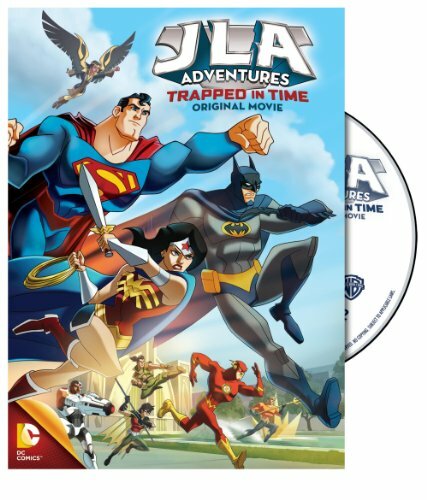 Packed with non-stop action, JLA Adventures: Trapped in Time comes to DVD on May 20, 2014 for $19.98 SRP. The all-new original movie is a thrilling film for the whole family and features some of the Justice League's most notable members. Fans won't want to miss this action-packed hit! After crafting a monumentally over-the-top plan to take over the world by expanding the polar ice caps, mastermind Lex Luthor is missing and widely presumed dead. One thousand years later, Luthor is discovered and memorialized in the Legion of Superheroes' museum, where the teenage superhero, Karate Kid, accidentally releases him. The museum contains both the knowledge of Superman's secret identity and a way to time travel, in the form of the mysterious, Time Trapper. Once Lex Luthor is free, he quickly sets out on a mission to permanently erase Superman from the time stream. For the Justice League - Superman, Batman, Wonder Woman, The Flash, Cyborg and Aquaman - along with Robin and teen super heroes Karate Kid and Dawnstar, the stakes have never been higher. Facing the deadliest rescue mission to date, the future lies in the hands of the Justice League as it struggles to confront its most critical challenge... the threat of having never existed! "Fans of the Justice League have been very passionate about wanting to see more stories involving their favorite characters," said Sam Register, President, Warner Bros. Animation and Warner Digital Series. "Our hope with JLA Adventures: Trapped in Time is to reward that passion with the same high levels of action and storytelling that fans have come to expect in a Justice League animated film." "We are thrilled to introduce this exciting new Justice League film with the release of JLA Adventures: Trapped in Time ," said Mary Ellen Thomas, WBHE Vice President, Family & Animation Marketing and Partner Brands. "The Justice League brand is already a favorite and will continue to engage fans with its group of vibrant Super Heroes." Warner Bros. Home Entertainment (WBHE) brings together Warner Bros. Entertainment's home video, digital distribution, interactive entertainment, technical operations and anti-piracy businesses in order to maximize current and next-generation distribution scenarios. An industry leader since its inception, WBHE oversees the global distribution of content through packaged goods (Blu-ray Disc and DVD) and digital media in the form of electronic sell-through and video-on-demand via cable, satellite, online and mobile channels, and is a significant developer and publisher for console and online video game titles worldwide. WBHE distributes its product through third party retail partners and licensees, as well as directly to consumers through WBShop.com. Warner Bros. Animation (WBA) is one of the leading producers of animation in the entertainment industry, producing and developing both CG and traditionally animated projects for multiple platforms, both domestically and internationally. For TV, WBA produces series such as Beware the Batman, Teen Titans Go!, The Tom and Jerry Show and the upcoming Be Cool Scooby-Doo! and Wabbit - A Looney Tunes Production for Cartoon Network; original animated DC Nation shorts for Cartoon Network; and the forthcoming Mike Tyson Mysteries series for Cartoon Network's Adult Swim. As the home of the iconic animated characters from the DC Comics, Hanna-Barbera, MGM and Looney Tunes libraries, WBA also produces highly successful animated films -- including the DC Universe Animated Original Movies -- for DVD. One of the most-honored animation studios in history, WBA has won six Academy Awards(R), 35 Emmy(R) Awards, the George Foster Peabody Award, an Environmental Media Award, a Parents' Choice Award, the HUMANITAS Prize, two Prism Awards and 20 Annie Awards (honoring excellence in animation).